Joey450r - Florida Great slip on "Sounds great. Nice loud deep roar. Bike revs faster. 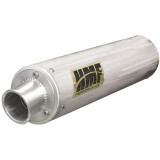 Make sure to follow Hmf jetting recommendations. I did and they were spot in." Dj266 Sounds amazing "This is a great exhaust system. Sounds amazing looks better and I can feel the difference in the acceleration. You probably will have to change the jetting. Only took about 10 minutes to install, and they give you all the accessories needed."